Wanda N. Olszewski, 91, of New Britain, passed away Oct. 18, 2018. She was born in Brooklyn, N.Y., a daughter of Auriello and Annina (D’Aloisio) Nanni. Wanda was a communicant of St. Jerome, now St. Katherine Drexel Church. 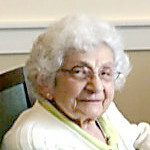 She worked at Peoples Savings Bank and enjoyed her social luncheons with the “bank girls.” She was one of the original volunteers for St. Jerome Bingo Program and enjoyed pinochle at the New Britain Senior Center. She also volunteered for the American Red Cross blood drives. She was predeceased by her beloved husband, John R. Olszewski in 1993 and her daughter, Anita Olszewski in 2016. She is survived by her daughter, Joan Clark and her husband, Daniel of New Britain, two grandchildren, Alan Clark of New Britain, and Amanda Monroe and her husband, Christopher of New Hampshire, and one great-grandson, Caleb Monroe. Her memorial mass will be held Friday, Oct. 26, 2018, at 10 a.m. at St. Jerome Church, 1010 Slater Road, burial will follow in St. Mary Cemetery, Stanley St., both in New Britain. There are no visiting hours. Posted in New Britain Herald, on Tuesday, 23 October 2018 20:42. Updated: Tuesday, 23 October 2018 20:45.